The B-Team have done it again! Once again the B Team has a fantastic special guest coming to join them in the Crypt. 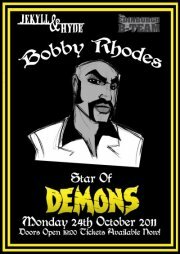 Bobby Rhodes, star of both Demons and Demons 2, will be in attendance on Monday 24th October to accompany a double bill screening of both movies. As usual there will be a Q&A session, signings and some of the greatest merchandise to ever visit the B-Team. Tickets are available now (£5) from the Jekyll and check out the T-Shirts that Bobby will be bringing along, one of which to be given away in a prize draw after the Q&A. This entry was posted on Sunday, October 16th, 2011 at 2:44 am	and is filed under Events, News. You can follow any responses to this entry through the RSS 2.0 feed. You can leave a response, or trackback from your own site.